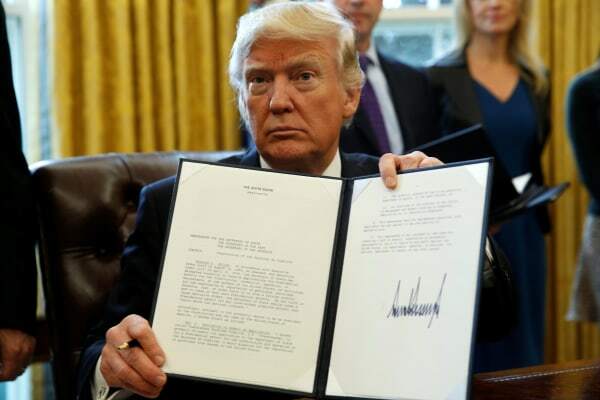 It's been less than a month since Donald Trump took office, and the 45th president has already signed a dozen wide-ranging executive orders, hoping to fulfill a number of his campaign promises. Surrounded by staff during Oval Office photo opportunities, Trump signed the burst of orders within just his first three weeks to undo many of President Barack Obama's policies. Hours after being sworn in, Trump signed an executive order aimed at reversing the Affordable Care Act — Obama's landmark legislation — which Republicans vowed to "repeal and replace" throughout the campaign. The executive order states that the Trump administration will "seek prompt repeal" of the law. To minimize the "economic burden" of Obamacare, the order instructs the secretary of health and human services and other agency heads to "waive, defer, grant exemptions from, or delay the implementation" of any part of the law that places a fiscal burden on the government, businesses or individuals. Also in the order are directions to give states more control over implementing health-care laws. The order is widely believed to have been issued in response to the protests against the Dakota Access Pipeline. The order also creates an office to assist the victims of crimes committed by undocumented immigrants and calls on local and state police to detain or apprehend people in the United States illegally. The order is aimed at fulfilling one of Trump's key campaign promises — enhancing border security — by directing federal funding to construction of a wall along the Mexico-U.S. border. It instructs the secretary of homeland security to prepare congressional budget requests for the wall and to "end the abuse of parole and asylum provisions" that complicate the removal of undocumented immigrants. Other parts of the order call for hiring 5,000 more Border Patrol agents, building facilities to hold undocumented immigrants near the Mexican border and ending "catch-and-release" protocols, in which immigrants in the United States without documentation are not detained while they await court hearings. The order suspends the entry of immigrants from seven Muslim-majority countries — Syria, Iran, Iraq, Libya, Sudan, Yemen and Somalia — for 90 days and stops all refugees from entering the country for 120 days. Syrian refugees are banned indefinitely. During the time of the ban, the secretary of homeland security and the secretary of state will review and revise the refugee admission process. Also in the order is the suspension of Obama's 2012 Visa Interview Waiver Program, which allowed frequent U.S. tourists to bypass the visa interview process. White House officials have made a number of contradictory statements, at times calling the order a "ban" and at other times referring to it as a "travel restriction." After the order was signed, thousands of protesters popped up at airports across the country to denounce it. This order stops all executive branch officials from lobbying for five years after they leave office and places a lifetime ban on lobbying a foreign government. The order enacts a number of other lobbying restrictions, including, banning appointees from accepting gifts from registered lobbyists and banning appointees who were lobbyists from participating in any issues they petitioned for within the last two years. Some raised concerns over how Trump will fill the jobs in his administration under the new rules. The order states that executive departments and agencies must slash two regulations for every one new regulation proposed. Regulation spending cannot exceed $0, and any costs associated with regulations must be offset with eliminations. The order also directs the head of each agency to keep records of the cost savings, to be sent to the president. Making regulation "efficient, effective and appropriately tailored"
The order directs the treasury secretary to review financial regulations and report back to the president 120 days later with a determination of whether current policies promote the "Core Principles." The order directs Attorney General Jeff Sessions to create a task force that would propose new legislation to reduce crime, highlighting drug trafficking, illegal immigration and violent crime. The task force will submit yearly reports to the president. Throughout the campaign, Trump promised voters a return to "law and order" in the United States and said minorities from inner cities are "living in hell" because of violent crime. The order calls on the Justice Department to "enhance the protection and safety" of law enforcement by increasing penalties for crimes committed against officers. The attorney general is also instructed to review and determine whether existing federal laws adequately protect law enforcement and later to propose legislation to better protect officers. The order directs the Justice Department to recommend changes in federal grant funding to law enforcement programs if they do not protect officers. The order outlines the administration's approach to cutting down on organized crime — including gangs, cartels and racketeering organizations — by enhancing cooperation with foreign governments and the ways in which federal agencies share information and data. It identifies human trafficking, drug smuggling, financial crimes, cyber-crime and corruption as "a threat to public safety and national security." The Threat Mitigation National Intelligence — of which Sessions, Secretary of State Rex Tillerson, and the secretary of homeland security are co-chairmen — will review and recommend changes to federal agencies' practices in a report to be delivered to the president within 120 days. Two weeks after Trump fired Acting Attorney General Sally Yates, this order changes the order of succession for Sessions, who won approval as attorney general last week. The sequence is: the U.S. attorney for the Eastern District of Virginia, the U.S. attorney for the Northern District of Illinois and the U.S. attorney for the Western District of Missouri. A week before leaving office, Obama signed an executive order changing the order of succession without explanation.